Notes: Bridgnorth Castle is a castle in the town of Bridgnorth, Shropshire beside the River Severn. 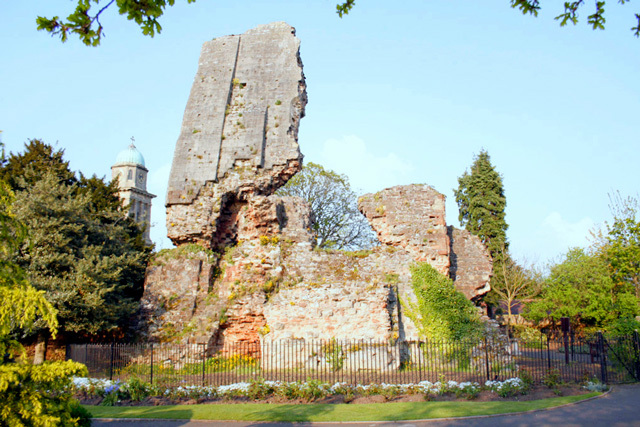 The castle was founded in 1101 by Robert de Belleme, the son of the French Earl, Roger de Montgomery, who succeeded his father to become the Earl of Shrewsbury. Its principal feature, a square great tower, was built during the reign of Henry II. During the Civil War, Bridgnorth was one of the Midlands' main Royalist strongholds and in 1642 many Royalist troops were garrisoned there. In 1646, Cromwell's Roundheads arrived with orders to take Bridgnorth for the Parliamentarians from the garrison led by Sir Robert Howard. Following a three-week siege, Cromwell was successful and he ordered that the castle be demolished. By 1647 little of the structure remained. The Parliamentarians left it much as it is today, the stone from the castle being taken and used to repair the town's damaged buildings.Parts of the great tower still remain, but because of the damage caused during the Civil War, it now leans at an angle of 15 degrees, 4 times the lean of the leaning tower of Pisa. The castle grounds were excavated over three days by archaeological television programme Time Team, clarifying the layout of the castle and the history of its construction.